Looking for a list of surgeons’ contact information? 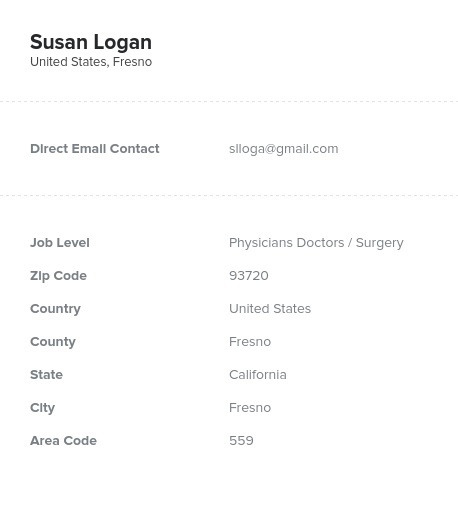 Pull this accurate directory, which contains surgeons’ emails, phone numbers, addresses, names, and more. If you want to get in touch with surgeons from numerous hospitals and clinics, download this pre-built directory now. Surgery is fast-paced and stressful, taking a huge amount of skill and concentration. No matter what kind of surgery one is performing, the level of medical knowledge required is high. If you want to talk to an elite group of medical experts working in surgery, then download this database. This is one of our pre-made data products and is ready for you to download right away. Within minutes, you can start connecting with surgeons from across different hospitals at once. Many types of medical equipment are required for surgery to be a success. Using this list, you can market a vast array of medical products: surgical supplies such as scrubs, masks, and caps; tools; medical cameras and monitors; technology such as robotic equipment; or other relevant devices. Surgeons use a variety of tools to treat the often-severe issues of their patients. If you have a product or service that can help them do their jobs cleanly, quickly, and efficiently, talk to them using this list. Start emailing, calling, or mailing surgeons with the help of this accurate, human-verified directory. It's full of the information you need and is backed by our bounce-back guarantee. Buy it and start connecting with surgeons today!